It’s been quite some time since we’ve tossed out a friendly update, and it’s high time we remedy that. 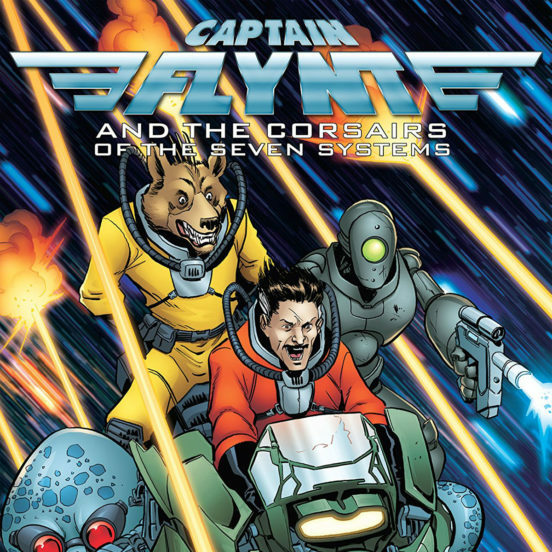 Last month you may have noticed that we quietly helped launch a new book called Captain Flynt and the Corsairs of the Seven Systems! If you missed it, now is your chance to fix that – you can grab a physical copy by visiting the Robot Paper shop or a digital copy from Comixology. 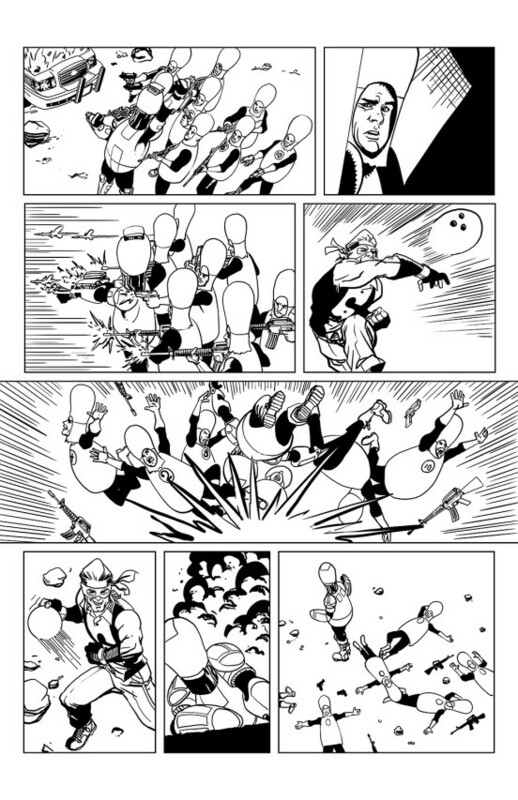 Featuring art by Ryan Howe and a host of other talented folks, Captain Flynt is packed full of swashbuckling space adventure. 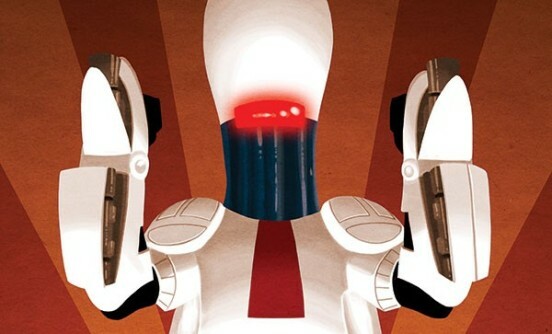 If you are fan of Star Wars, Buck Rogers, or really anything in space be sure to pick it up! 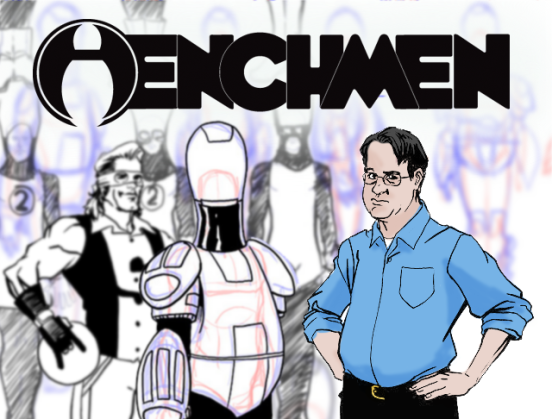 We are happy to share that the Henchmen trade paperback can now be ordered from our online store! 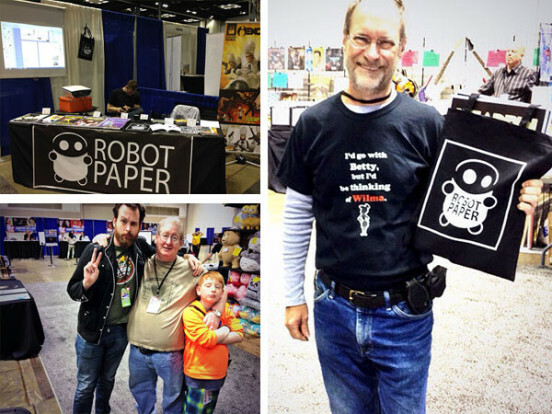 Holy moley folks – lots of stuff happening in our world over at Robot Paper HQ. 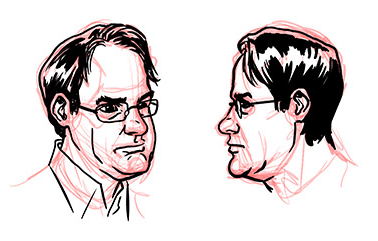 Updates about our forthcoming trade paperback, and awesome new comics from Ryan Howe! 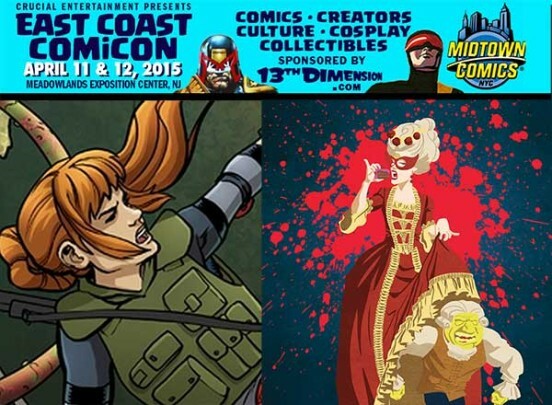 The Henchmen team will be at all the cons this weekend – be sure to come by and see us if you are nearby, and click through to get a sneak preivew of Henchmen: I, Henchbot #4! 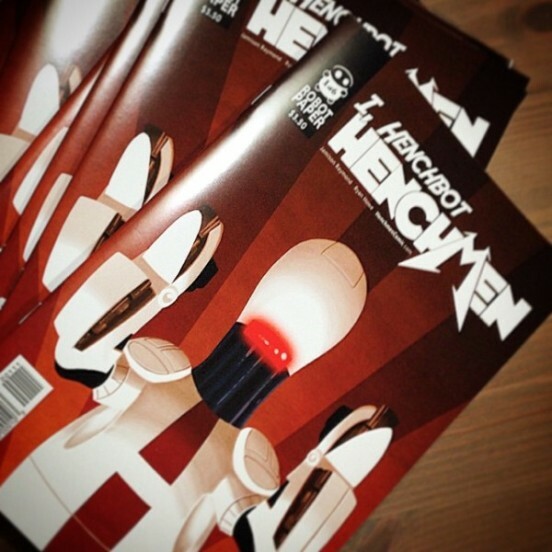 Henchmen: I, Henchbot #2 is in stores now, and available on Comixology. 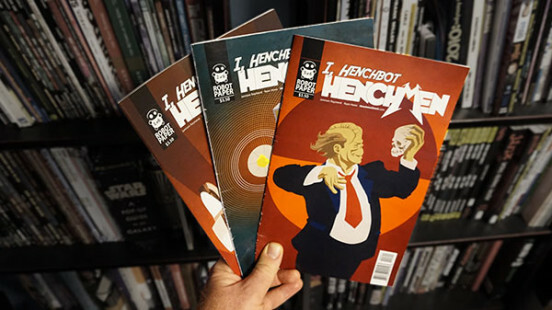 I Henchbot #1 hits stores today! Hello hench-people. 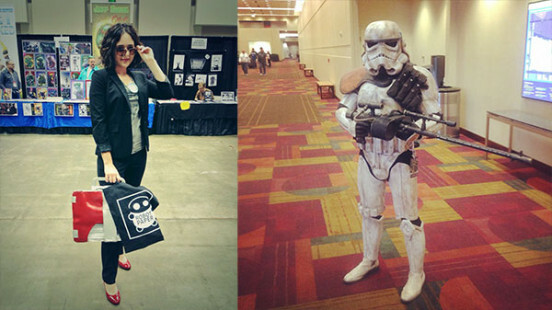 A quick update to inform you that Brian is hanging out in artist’s alley at Awesome Con Indianapolis this weekend. If you are planning on attending the show, be sure to stop by table B4. We have copies of all of our books, the remaining prints from Ryan Howe’s recruitment poster set, and a few copies of Heroes Wanted available for sale if you missed out at Gen Con. 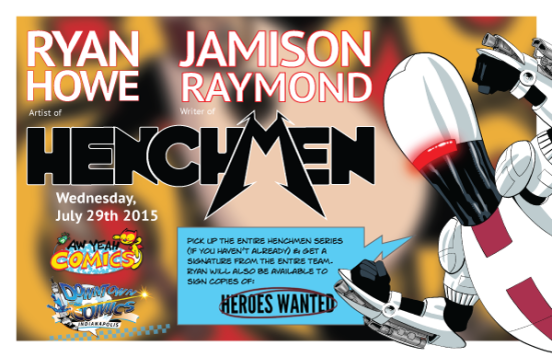 Hi everyone – we’ve been at a couple of shows this summer, and we have some stuff left over that we are offering to Henchmen fans! 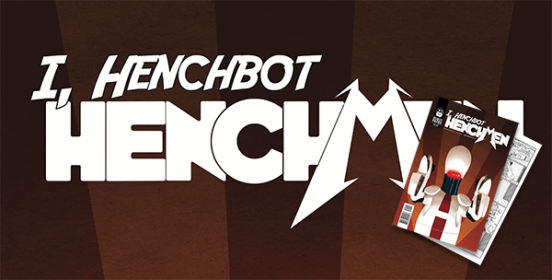 We have 15 limited edition “I, Henchbot” packs, including three villain recruitment prints and a copy of “I, Henchbot” signed by Jamison and Ryan – all in an awesome screen printed Robot Paper canvas tote – get one before they are gone! More News! We are happy and flattered to be included in Comixology’s list of top 100 independent books on their platform – If you have been waiting to add it to your Comixology account, now is the time to pick it and 99 other awesome books up for $10! This offer ends on March 10th at 11pm EST in North America and at local evening times in other regions, so click through and check it out! 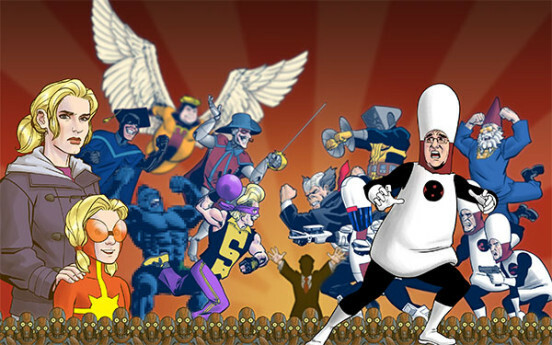 I am pleased to let everyone know that we’ve partnered with Action Phase Games on their new game Heroes Wanted. 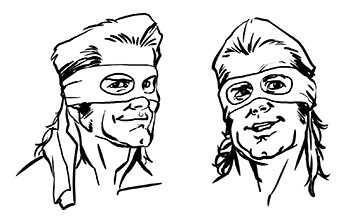 Featuring amazing card and box art from our own Ryan Howe, there are some pretty awesome surprises in store for super-hero and henchmen fans. Gary does some last minute Christmas Shopping. Happy Holidays! To celebrate we’ve given Gary a rather unwelcome surprise. 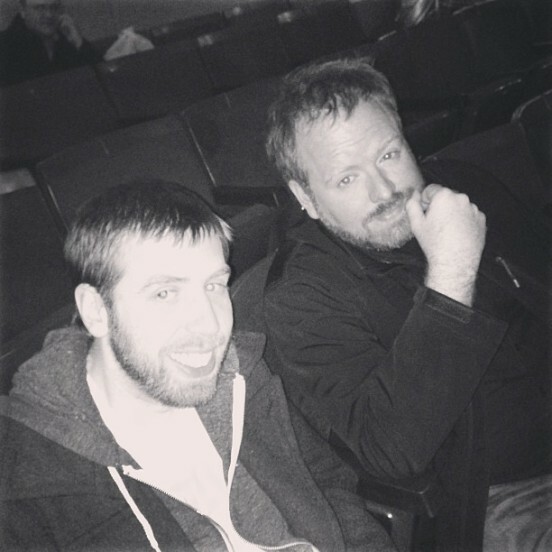 Check out part one of our free Holiday Special, and stay tuned this week and see what Gary gets for Christmas. 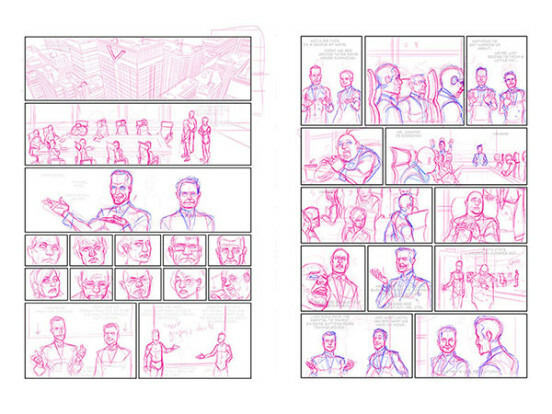 Ryan showcases some of his page art for Henchmen issue two with a behind the scenes look at his process and how he works with Jamison’s script. 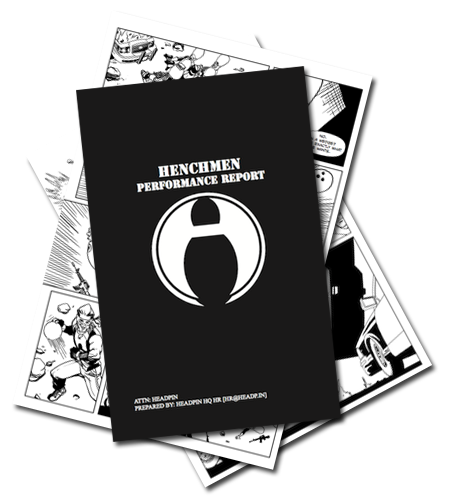 Henchmen #1 is from now and for the foreseeable future a free download – be sure to tell your friends, and send them copies for a last minute Holiday Gift! 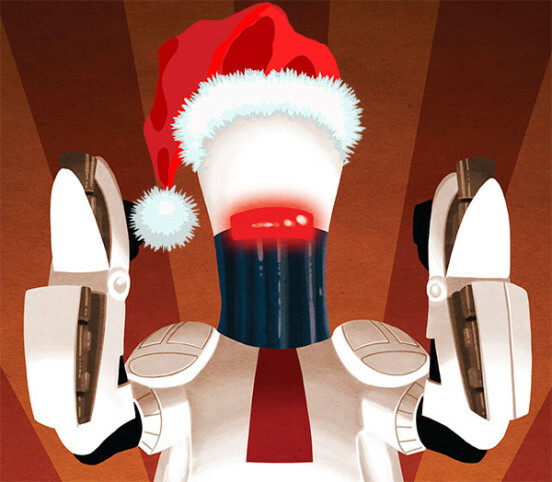 Happy Cyber Monday, Cyber-people. 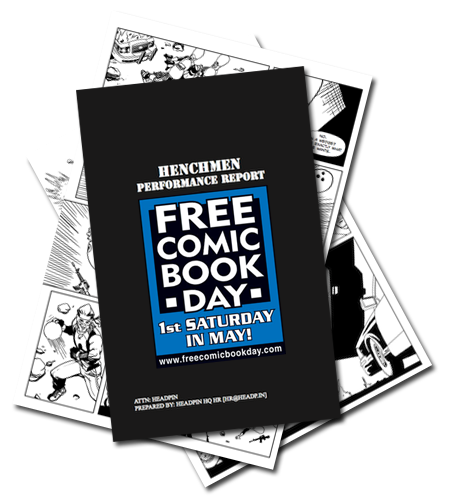 Henchmen Digital is Free in our Shop today and we are offering 10% off in our shirt shop today only – use Coupon Code CYBERMEN when checking out. 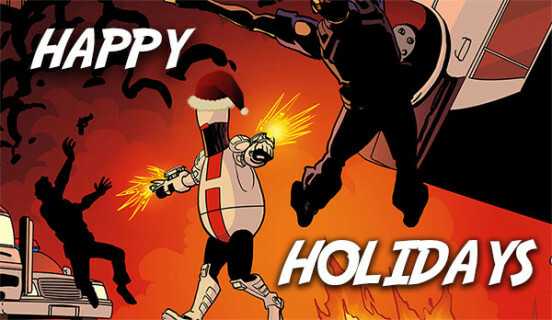 Happy Holidays from the Henchmen team! 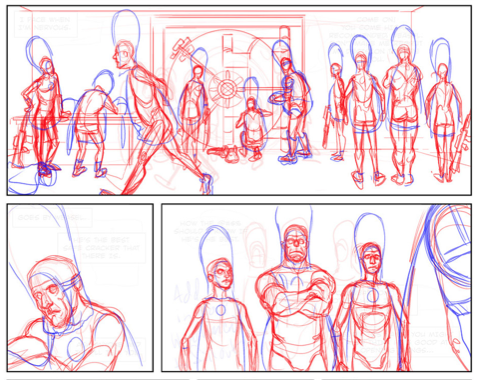 Production is in full swing on the first issue of the new Henchmen mini-series, and it’s going to be a heck of a ride. 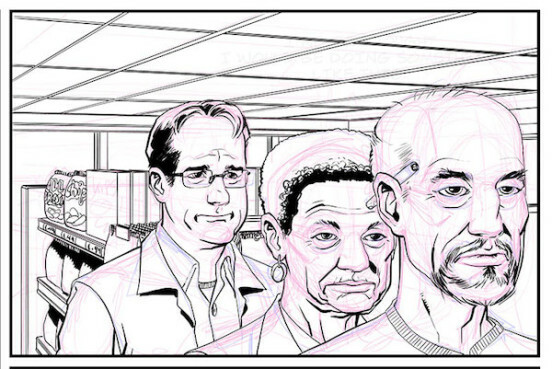 With a lot of groundwork laid in the first one-shot, we’re really opening things up to breathe more, and get a chance to see more of Gary’s world. 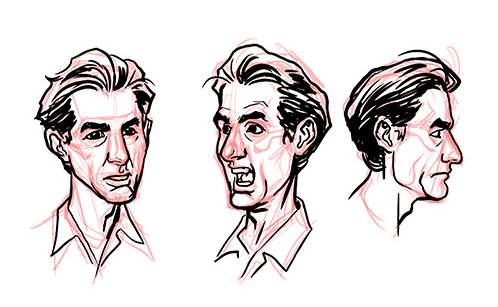 Check out Ryan’s art update! 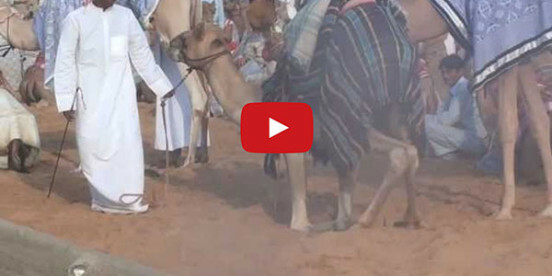 Jamison has been on quite the adventure in the middle east. Read all about his Indiana Jones antics! 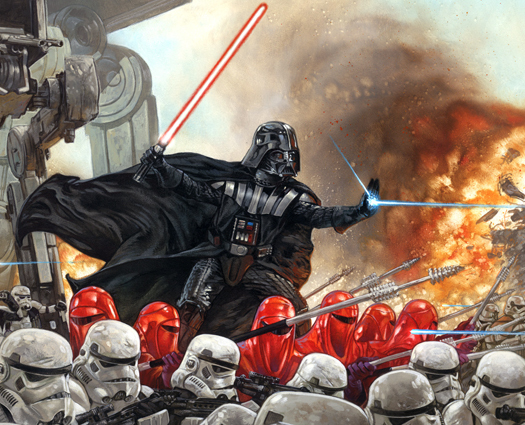 Dave Dorman has taken time from his busy GenCon schedule to join Jamison for an in-store signing at Downtown Comics on Saturday August 17th from 10 a.m. to 1 p.m. 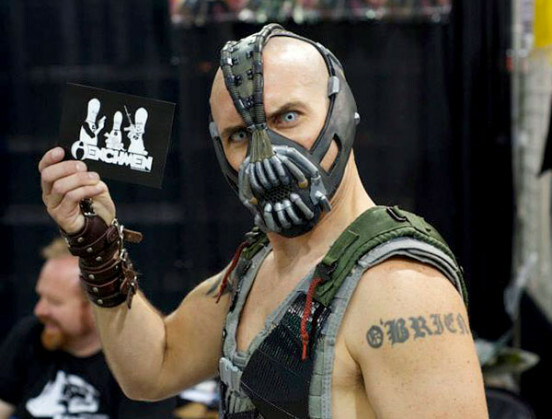 Wish We Were There – San Diego Comic Con is Happening Now! 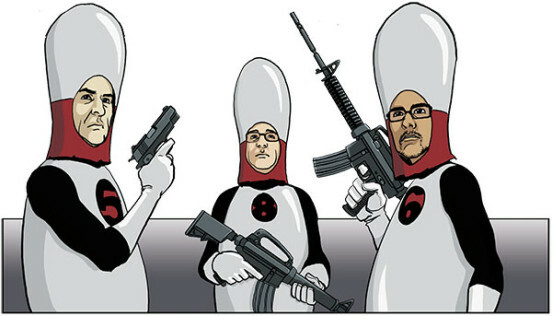 We all wish we could be at San Diego Comic Con this week, and so does Gary. Since we couldn’t make it, we are drowning our sorrows in coupon codes for anyone wanting to order copies of the book – click through for the coupon code! If you are at SDCC – let us know! 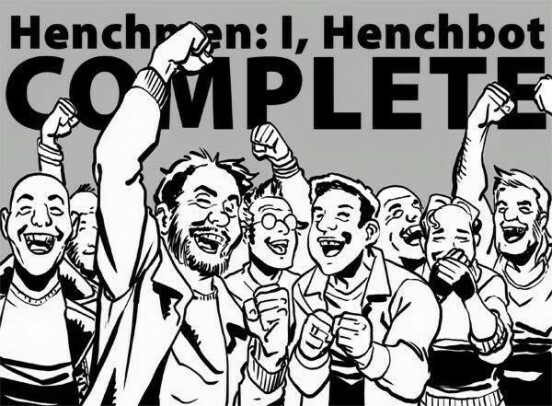 It’s time – starting today everyone on the internet can visit us at HenchmenComic.com/shop and buy a digital copy of Henchmen! Tell your friends! We’ve been looking forward to sharing this with you guys for some time, and over the weekend Dave sent us the final scans of his cover. Here it is, we hope you love it as much as we do. 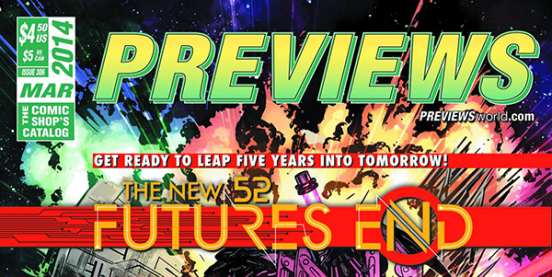 Free Previews for everyone – tell your friends! We are almost there! 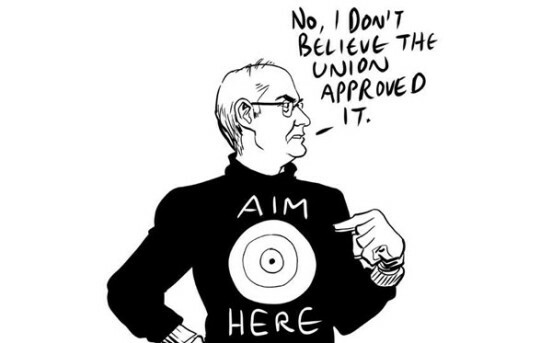 We’ll be sending Issue number one to the printer soon! It’s almost May already and we can’t believe it! 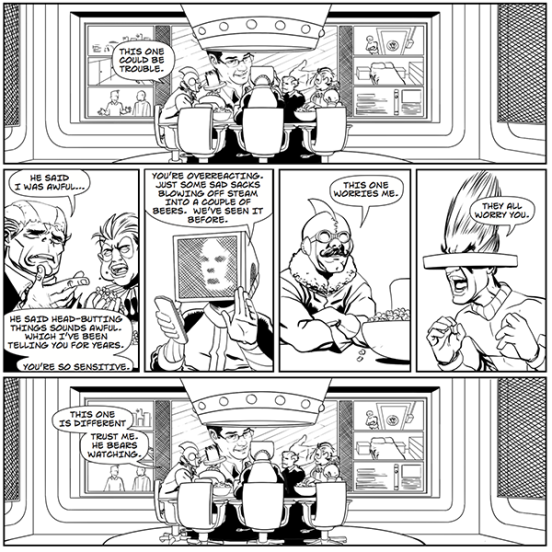 We have decided to celebrate yet again by sharing a black and white preview issue with anyone who is on our email list by Free Comic Book Day, THIS SATURDAY! Be sure to sign up if you haven’t, and tell your friends if you have! We’ve done it, and announced some very special new backer tiers during our last weekend! Henchmen Number One, Now With Dave Dorman Cover Art! 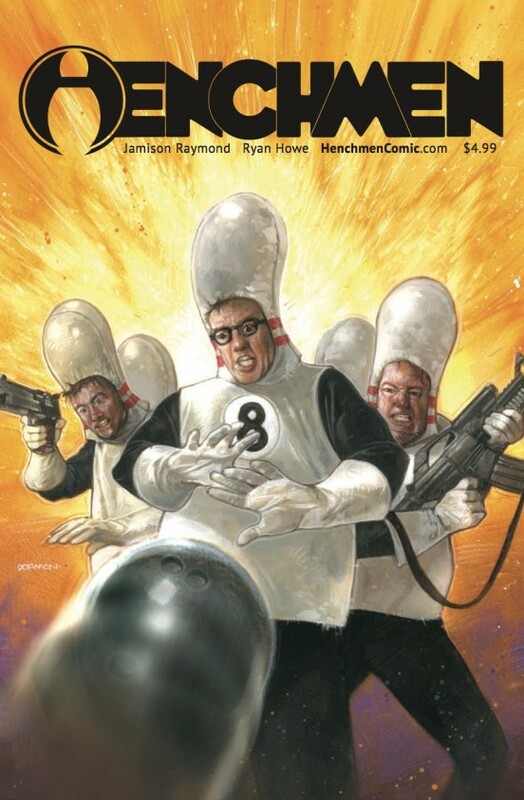 Dave Dorman will be doing the cover for Henchmen number one! 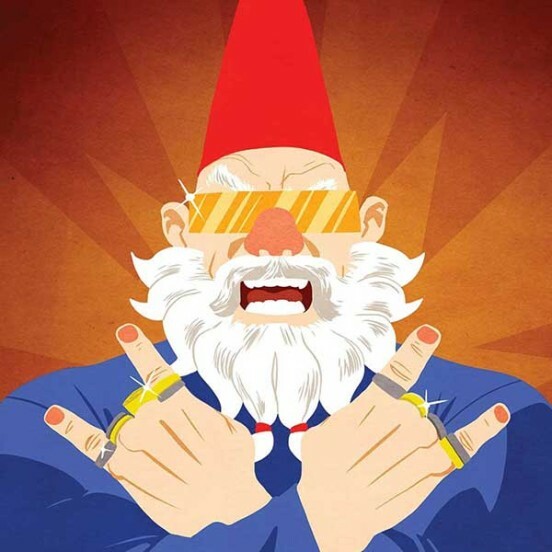 We’ve been busy promoting things over at KickStarter! We were approved on KickStarter and already have a handful of backers – be sure to check our video below and get over the page ASAP! 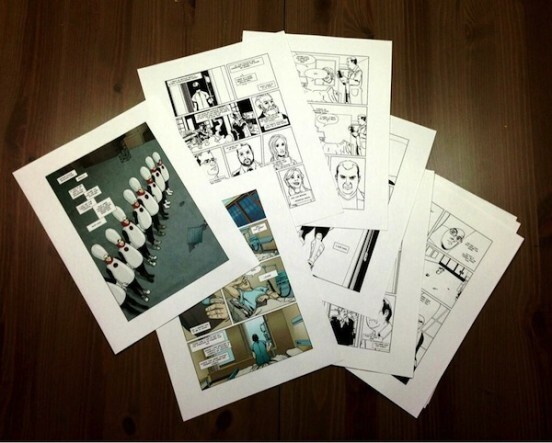 Ryan sent this over to us yesterday, just in time for the KickStarter project. It is our first full page art, and it is amazing! We are submitting our project for review today, so stay tuned. 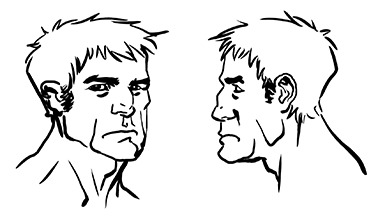 As our KickStarter launch looms, we are happy to post concept art for Headpin, our story’s villain and nemesis of Striker. 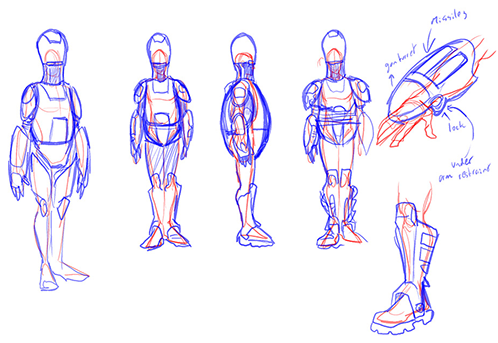 Up next in our roll out of character concept art is Weasel, another one of Gary’s new co-workers. 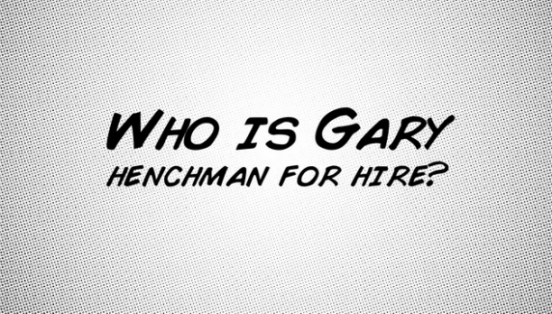 We introduce our protagonist, Gary.